Beauty Products – Are They Safe? Of the 10,500 ingredients used in cosmetics, the industry’s self-policing safety panel has reviewed just 11 percent for safety, and the FDA does no regular safety reviews. 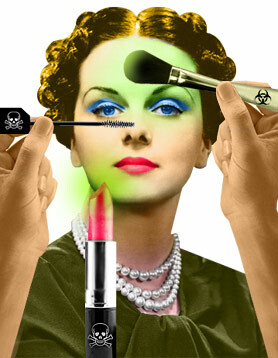 Ninety percent of the ingredients regularly used in U.S. cosmetics have never been evaluated for safety. Ingredients in personal care products account for one of every eight of the 82,000 industrial chemicals approved for use in the United States. Eighty percent of these industrial chemicals are approved in three weeks or less and may not have undergone safety testing. Parabens – Parabens are widely used preservatives that prevent the growth of bacteria, mold and yeast in cosmetic products. Sounds good, right? Not so fast, they do more than that. Parabens possess estrogen-mimicking properties that are associated with increased risk of breast cancer. These chemicals are absorbed through the skin and have been identified in biopsy samples from breast tumors. They can be found in makeup, body washes, deodorants, shampoos and facial cleansers. You can also find them in food and pharmaceutical products. Synthetic Colors – If you take a look at your product label and notice FD&C or D&C, they represent artificial colors. F — representing food and D&C representing drug and cosmetics. These letters precede a color and number (e.g., D&C Red 27 or FD&C blue 1). These synthetic colors are derived from petroleum or coal tar sources. Synthetic colors are suspected to be a human carcinogen, a skin irritant and are linked to ADHD in children. The European Classification and Labeling considers it a human carcinogen and the European Union has banned it. 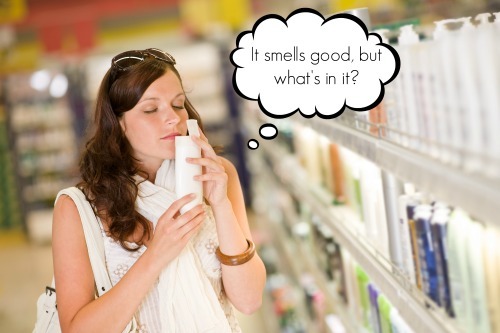 Fragrance – This particular category is pretty scary, because what does “fragrance” mean anyway? This term was created to protect a company’s “secret formula.” But as the consumer you could be putting on a concoction that contains tons of chemicals that are hazardous to your health. According to the Environmental Working Group (EWG) Skin Deep Database, fragrance mixes have been associated with allergies, dermatitis, respiratory distress and potential effects on the reproductive system. It can be found in many products such as perfume, cologne, conditioner, shampoo, body wash and moisturizers. Phthalates – A group of chemicals used in hundreds of products to increase the flexibility and softness of plastics. The main phthalates in cosmetics and personal care products are dibutyl phthalate in nail polish, diethyl phthalate in perfumes and lotions, and dimethyl phthalate in hair spray. They are known to be endocrine disruptors and have been linked to increased risk of breast cancer, early breast development in girls, and reproductive birth defects in males and females. Unfortunately, it is not disclosed on every product as it’s added to fragrances (remember the “secret formula” not listed), a major loophole in the law. They can be found in deodorants, perfumes/colognes, hair sprays and moisturizers. Triclosan – Tricolson is widely used antimicrobial chemical that’s a known endocrine disruptor — especially thyroid and reproductive hormones, and a skin irritant. Studies raise concerns that triclosan contributes to making bacteria antibiotic-resistant. There also wasn’t enough supporting evidence that washing with antibacterial soaps containing triclosan provides any benefit over washing with regular soap and water. Tricolson can be found in toothpastes, antibacterial soaps and deodorants. Sodium Lauryl Sulfate (SLS) / Sodium Laureth Sulfate (SLES) – This surfactant can be found in more than 90 percent of personal care and cleaning products (think foaming products). SLS’s are known to be skin, lung, and eye irritants. A major concern about SLS is its potential to interact and combine with other chemicals to form nitrosamines, a carcinogen. These combinations can lead to a host of other issues like kidney and respiratory damage. They can be found in shampoo, body wash/cleanser, mascara and acne treatment. Propylene Glycol – Propylene glycol is a small organic alcohol commonly used as a skin-conditioning agent. It’s classified as a skin irritant and penetrator. It has been associated with causing dermatitis as well as hives in humans — these sensitization effects can be manifested at propylene glycol concentrations as low as 2 percent. It can be found in moisturizers, sunscreen, makeup products, conditioners, shampoo and hair sprays. 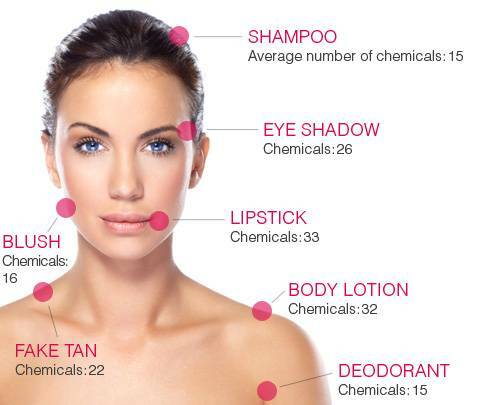 It’s impossible to avoid every single synthetic chemical on the planet, but you can do your part in limiting the amount of toxins your body is exposed to. Be sure to eat clean, avoid chemical-laden processed foods, drink plenty of filtered water and look for products that are certified organic if you want to avoid these toxic chemicals. Read Labels!! Educate yourself and do your research before you buy. Think of something you absolutely love, and the time and energy you apply to it. Use the same, when it comes to your health. You have one life to live and one body. If you don’t take care of yourself, you may pay for it later in sickness.